The Fourth International (FI) is the Communist international organisation consisting of followers of Leon Trotsky, or Trotskyists, with the declared goal of helping the working class bring about socialism and work toward international communism. The Fourth International was established in France in 1938: Trotsky and his supporters, having been expelled from the Soviet Union, considered the Comintern or Third International to have become "lost to" Stalinism and incapable of leading the international working class to political power. Thus, Trotskyists founded their own, competing "Fourth International". Today, there is no longer a single, cohesive Fourth International. Throughout the better part of its existence, the Fourth International was hounded by agents of the Soviet secret police, repressed by capitalist countries such as France and the United States and rejected by followers of the Soviet Union and later Maoism as illegitimate—a position these communists still hold today. It struggled to maintain contact under these conditions of simultaneous illegality and scorn around much of the world during World War II, because when workers' uprisings did occur, they were usually under the influence of Soviet-inspired, anarchist, social democratic, Maoist, or militant nationalist groups, leading to further defeats for the FI and its Trotskyists, who never gathered similar support. Even after the Soviet repudiation of Stalin and de-stalinization, Trotskyism continued to be regarded as politically discredited and there was very little renewed support for Trotskyist ideas, particularly from those already committed to another form of communism. Ideologically, Maoists, left communists, and anarchists all consider Trotskyism, and thus also the Fourth International, to be ideologically bankrupt and impotent. Despite this, many parts of Latin America and Europe continue to have large Trotskyist groupings, with followings both young and old, who are attracted to its "anti-Stalinist" positions and its rhetoric of workers' internationalism. Quite a few of these groups carry the label "Fourth Internationalist" either in their organisation's name, major political position documents, or both. The Fourth International, in line with its Trotskyist underpinnings, tended to view the Comintern as worthy of conditional support even considering its corruption, and although it regarded its own ideas as more advanced and thus superior to those of the Third International, it did not actively seek the Comintern's destruction. It has not succeeded in capitalizing on the renewed interest in socialism and does not operate as a cohesive entity in the manner of the prior internationals. The FI suffered a major split in 1940 and an even more significant split in 1953. A partial reunification occurred in 1963, but the international never recovered enough to re-emerge as a single transnational grouping. Trotskyists' response to that situation has been in the form of its broad array of Trotskyist Internationals, almost all of whom are bitterly divided over which organisation represents the "true" Fourth Internationalist political continuity. Trotskyists regard themselves as working in opposition to both capitalism and Stalinism. Trotsky advocated proletarian revolution as set out in his theory of "permanent revolution", and believed that a workers' state would not be able to hold out against the pressures of a hostile capitalist world unless socialist revolutions quickly took hold in other countries as well. This theory was advanced in opposition to the view held by the Stalinists that "socialism in one country" could be built in the Soviet Union alone. Furthermore, Trotsky and his supporters harshly criticised the increasingly totalitarian nature of Joseph Stalin's rule. They argued that socialism without democracy is impossible. Thus, faced with the increasing lack of democracy in the Soviet Union, they concluded that it was no longer a socialist workers' state, but a degenerated workers' state. Trotsky and his supporters had been organised since 1923 as the Left Opposition. They opposed the bureaucratisation of the Soviet Union, which they analysed as being partly caused by the poverty and isolation of the Soviet economy. Stalin's theory of socialism in one country was developed in 1924 as an opposition to Trotsky's Theory of Permanent Revolution, which argued that capitalism was a world system and required a world revolution in order to replace it with socialism. Prior to 1924, the Bolsheviks' international perspective had been guided by Trotsky's position. Trotsky argued that Stalin's theory represented the interests of bureaucratic elements in direct opposition to the working class. Eventually Trotsky was sent into internal exile and his supporters were jailed. The Left Opposition, however, continued to work in secret within the Soviet Union. Trotsky was eventually exiled to Turkey. He moved from there to France, Norway, and finally to Mexico. He was assassinated on Stalin's orders in Mexico, by Ramón Mercader, a Spanish-born Soviet agent in August 1940. After the International Workingmen's Association disbanded in 1876, several attempts were made to revive the organisation, culminating in the formation of the Socialist International (Second International) in 1889. This, in turn, was disbanded in 1916 following disagreements over World War I. Although the organisation reformed in 1923 as the Labour and Socialist International, supporters of the October Revolution and the Bolsheviks had already set up the Communist International (Comintern), which they regarded as the Third International. This was organised on a democratic centralist basis, with component parties required to fight for policies adopted by the body as a whole. 1 2 3 4 5 The Transitional Program. Retrieved November 5, 2008. 1 2 "Manifesto of the Fourth International on the Dissolution of the Comintern", Fourth International, July 1943. ↑ Robert Conquest, The Great Terror: A Reassessment, Oxford University Press, 1991, ISBN 0-19-507132-8, p. 418. ↑ Joseph Stalin, "Industrialisation of the country and the right deviation in the C.P.S.U.(B. )", Works, Vol.11, pp. 255-302. 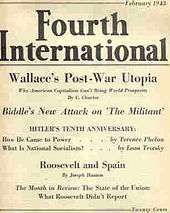 ↑ Leon Trotsky, "Open Letter For The Fourth International", New Militant, August 3, 1935. ↑ "Declaration of the Four", The Militant, September 23, 1933. ↑ John G. Wright, "Trotsky's Struggle for the Fourth International", Fourth International, August 1946. ↑ "Trotskyists at Vorkuta: An Eyewitness Report", International Socialist Review, Summer 1963. ↑ Mario Kessler, "Leon Trotsky's Position on Anti-Semitism, Zionism and the Perspectives of the Jewish Question", New Interventions, Vol. 5 No. 2, 1994 (transcript of a talk at the AGM of Revolutionary History magazine in October 1993. ↑ Arnold Beichman, "How Stalin, the 'breaker of nations,' hated, murdered Jews", Washington Times, August 16, 2003. ↑ Trotsky, In Defense of Marxism, New York 1942. 1 2 James P. Cannon, "Factional Struggle And Party Leadership", Fourth International, November 1953; David Holmes, James P. Cannon: His Life and Work. ↑ "Emergency Conference of the Fourth International", International Bulletin, Nos. 1 & 2, 1940. 1 2 3 Michel Pablo, "Report on the Fourth International Since the Outbreak of War, 1939–48" Fourth International, December 1948 & January 1949. ↑ Rodolphe Prager, "The Fourth International during the Second World War", Revolutionary History, Vol. 1 No. 3, Autumn 1988. ↑ "Resolution On The Unification of the British Section", International Bulletin, Nos. 1 & 2, 1940. ↑ The Fourth International During World War II (immediately afterward). ↑ Felix Morrow, "The First Phase of the Coming European Revolution", Fourth International, December 1944. ↑ "Perspectives and Tasks of the Coming European Revolution", Fourth International, December 1943. ↑ "Theses on the Liquidation of World War II and the Revolutionary Upsurge", Fourth International, March & May 1945. ↑ "The European Revolution and the Tasks of the Revolutionary Party", Fourth International, December 1944. ↑ Martin Upham, The History of British Trotskyism to 1949 (PhD thesis publische online on the Revolutionary History Website). ↑ Peter Schwarz, "The politics of opportunism: the 'radical left' in France", World Socialist Web Site. ↑ "The Conference of the Fourth International", Fourth International, June 1946. 1 2 Sam Bornstein and Al Richardson, War and the International, London 1986. ↑ Alex Callinicos, Trotskyism, Maidenhead 1990. ↑ Paul Samuelson, "Full Employment after the war," in S. Harris (ed. ), Post war Economic Problems, London & New York 1943. ↑ Joseph Schumpeter, "Capitalism in the post-war world". in S. Harris (ed. ), Post war Economic Problems, London & New York 1943. ↑ "The USSR and Stalinism", Fourth International, June 1948. ↑ "The Third World Congress of the Fourth International", Fourth International, November 1951. ↑ "The Fourth International in Vietnam", Revolutionary History, Vol. 3 No. 2, Autumn 1990. ↑ International Secretariat of the Fourth International, "An Open Letter to Congress, Central Committee and Members of the Yugoslav Communist Party", Fourth International, July 1948. ↑ Pierre Frank, "Evolution of Eastern Europe", Fourth International, November 1951. ↑ "Theses on Orientation and Perspectives", Fourth International, November 1951. ↑ "The International Situation and Tasks in the Struggle against Imperialist War", Fourth International, November 1951. ↑ Michel Pablo, "World Trotskism Rearms", Fourth International, November 1951. 1 2 SWP, "Open Letter to Trotskyists Throughout the World", Militant, November 16, 1953. ↑ "Resolution forming the International Committee", SWP Internal Bulletin; Michel Pablo, Pierre Frank and Ernest Germain, "Letter from the Bureau of the IS to the leaderships of all sections", November 15, 1953, Education for Socialists Bulletin. ↑ "David North addresses Sri Lankan Trotskyists on the 50th anniversary of the ICFI", World Socialist Web Site, November 21, 2003. ↑ "Resolution of the International Committee instructing publication of the documents", August 24, 1973, Workers Press, August 29, 1973. ↑ International Secretariat: "To all Members and All Organizations of the International Committee", Education for Socialists Bulletin. ↑ Michel Pablo, "The Post-Stalin 'New Course'", Fourth International, March 1953; Michel Pablo, The 4th International: What it is, What it aims at, Publications of the Fourth International, 1958. ↑ John McIlroy, "The Revolutionary Odyssey of John Lawrence", What Next, No. 26, 2003. ↑ Pierre Frank, The Fourth International: The Long March of the Trotskyists, London 1979. 1 2 "Trotskyism and the Cuban Revolution: A Debate", Intercontinental Press, May 11, 1981, on the What Next? website. 1 2 Farrell Dobbs and Joseph Hansen, Reunification of the Fourth International, International Socialist Review 1963. ↑ Ernest Mandel and Joseph Hansen, "Dynamics of World Revolution Today", International Socialist Review, Fall 1963. ↑ Alex Callinicos, "Regroupment, Realignment, and the Revolutionary Left", IST Discussion Bulletin, No. 1, July 2002. ↑ "About the International Committee of the Fourth International", World Socialist Web Site. ↑ Peter Schwarz, "Meetings on 50 years of the International Committee of the Fourth International", World Socialist Web Site. ↑ Peter Taaffe, A Socialist World is Possible: The history of the CWI, Committee for a Workers' International. ↑ "Manifesto of the 4th World Congress", on the Socialist Organizer website. ↑ "Forward to the Fifth International! ", on the League for the Fifth International website. ↑ Sean Matgamna, "What we are, what we do and why we do it", Solidarity 3/72, April 28, 2005. ↑ David North, "Ernest Mandel, 1923–1995: A critical assessment of his role in the history of the Fourth International", World Socialist Web Site. ↑ "The Fourth International", International Socialist Group website. David North, The Heritage We Defend (1988) ISBN 0-929087-00-3, 539pp., a history of the Fourth International.